On my last podcast I talked about recipes that I had pulled out of various magazines to try. Recipe hunting can be hit or miss and I've found that I run about 50% with ones that I pull out of magazines. Sometimes they look and sound so good but for some reason do not translate into great food on the table. Last night my gamble paid off as dinner was delicious. I made Tofu-Vegetable Tacos with Eggplant-Ancho Spread from Alyssa Gorelick in the June 2012 issue of Food and Wine Magazine. Now I like tofu...I really do. This recipe intrigued me as the tofu is barbecued right along side the zucchini, peppers, onions and tomatoes. Barbecued tofu? I thought it would fall apart on the grill but it did not. I did follow the directions by squeezing out all of the water via sandwiching between plates (with more plates on top) which allowed the tofu to solidify more. 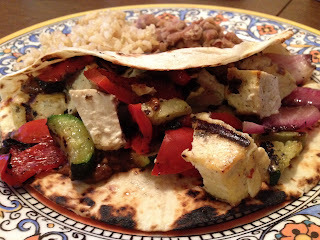 The eggplant-ancho spread was something I had never tried before either - a great mix of flavors which worked perfectly with the barbecued vegetables and tofu. It was a hit and the recipe has gone in the permanent file of my cookbook binder. I'm linking up with Debbie over at her Tuesday at the Table feature. You must visit to see the Cheeseburger Stuffed Bomb she is featuring today....I'll be picking jalapenos in my garden this weekend! I haven't heard of that either...in fact I'm a bit of a tofu novice! Glad you found a keeper of a recipe though! Glad you could link up! I love tofu! And eggplant.